His musical education took place in Lima at the National Conservatoriy of Peru with Oscar Zamora, and later in Spain at “Real Conservatorio de Música de Madrid” with Soledad Plaza, José Luis Rodrigo and Gabriel Estarellas. He has a master degree in “Musical Intrepretation” from Andalucia University where he was under the guidance of such world-renowned masters as Ricardo Gallén and Joaquín Clerch. In addition, Mr Malca has taken masterclasses with Alexander Sergei Ramirez in Germany. A deep interest in musicology has encouraged him to study at Universidad Complutense of Madrid. He graduated with honors with a master degree entitled “Andrés Segovia” led by concert artist David Russell. An outstanding performance of Joaquïn Rodrigo´s masterpiece “Concierto de Aranjuez” with the Villa de Madrid orchestra led by Mercedes Padilla and the patronage of Madam Sofia Queen of Spain and the Prince and Princess of Asturias. TVE (Spanish National Broadcasting), Tele Madrid, Television de Castilla la Mancha, RTP, etc, have recorded interviews and performances dedicated to his work. First guitar prizes and many other distinctions such as the First National Guitar Competition and International Studies in Spanish Music in Compostela as well as the first prize in professorship “Andrés Segovia” given by master David Russell are some of Luis Malca’s merits as well. Also an active teacher, he has given masterclasses in Peru and Spain. 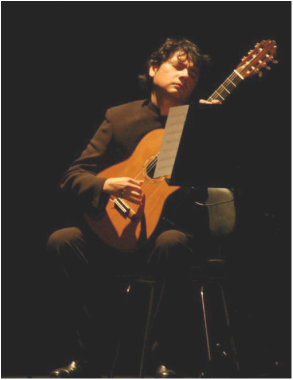 At present he is dedicated to musicological research, studying and performing original works for the guitar written by Peruvian composers from colonial period forward.